The Government has agreed to Fianna Fáil’s request for a full Dáil debate on the major broadband problem facing rural Ireland. Fianna Fáil Spokesperson on Communications in the Seanad Senator Mark Daly has welcomed this but called on the Government to stop paying lip-service to the roll-out of rural broadband. He commented: “I welcome the fact that the Minister for Communications, Alex White, has agreed to Fianna Fáil’s request for a full Dáil and Seanad debate on the major problems with broadband in rural Ireland. 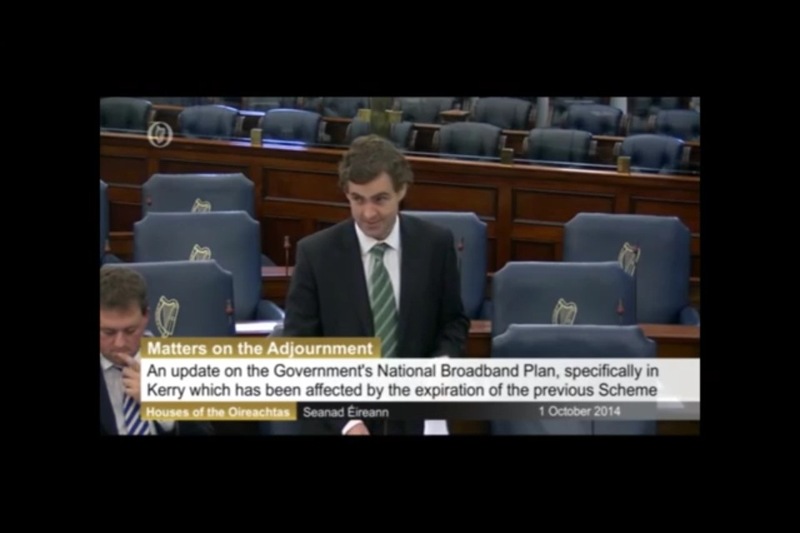 “The Government has repeatedly committed to delivering a quality broadband service to all areas of the country. This was reaffirmed before May’s local elections where the Government promised to deliver high quality broadband to all areas. “The Government then cynically scrapped the National Broadband Scheme; which provided basic broadband services to rural users through a subsidy to providers; after the local elections. It will directly result in broadband users having to pay an extra 176 per year for the service. “We have seen plans, targets and initiatives announced by the Government in relation to rural broadband but the reality in communities across the country is the service is not improving and in some cases it’s deteriorating. “Every business of any description conducts transactions on-line; without a secure and reliable broadband service rural companies cannot compete and will lose money and customers. If the Government is serious in its commitment to rural Ireland then actions must speak louder than words. “The communities in rural Ireland feel they are under attack from the Government. Deliberate policy choices have led to the closure of rural Garda stations, the closure of Post Offices and the closure of local social welfare offices, these choices are decimating local communities.